Picture of Thomas Paine. Photo via Wikimedia Commons. Carl Van Doren, poet and English professor at Columbia University, served as literary editor of The Nation from 1919 to 1922; he was succeeded by his brother Mark Van Doren, whose wife, Dorothy, was also on The Nation’s staff. One of the most brilliant critics of his day, Van Doren wrote this appreciation of the radical Thomas Paine, born on this date in 1737, for his column, “The Roving Critic,” in our issue dated May 8, 1922. 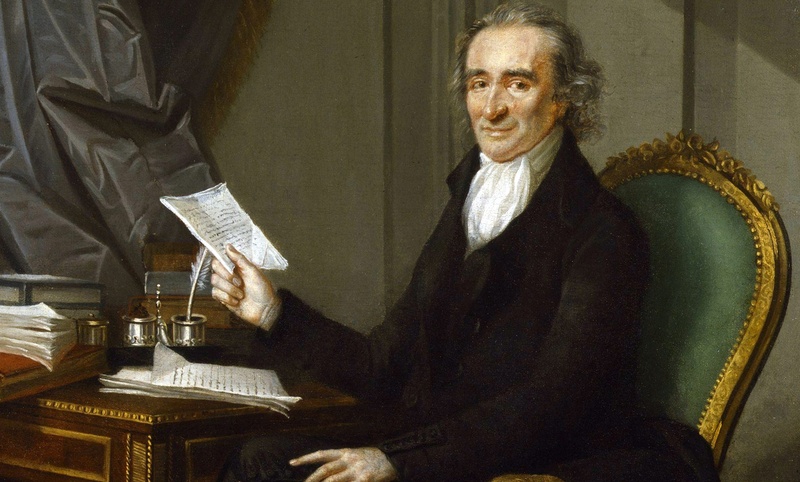 Thomas Paine is the Ragged Philosopher of his race. His books are the bible of village radicals, of boys and girls learning to argue and reflect up dingy alleys and in furtive garrets, of men and women everywhere who for lack of learning find it heard to enter the fields of liberal speculation. In his own day, indeed, it was his principal offense that like a different Socrates he brought philosophy to the people. He expounded in the market-place the discreeter deism of Franklin, Washington, Jefferson, of many a scented abbé in France, and of enough good British bishops. He preached republicanism where not only more or less comfortable kings could hear, but also their most hungry and discontented subjects. To Burke, whimpering over the age of chivalry, Paine spoke with the bitter voice of that vast majority of the populace which had never beheld the gold and silk of chivalry except as a distant spectacle, but had supported it with their sweat and blood and now saw it extinguished with scant regret. In language no one could misunderstand or overlook he struck at the code of honor that compelled the duel, at irrational notions of marriage and divorce, at the tyranny of masters over slaves, of husbands over wives, of mankind over dumb beasts. To Franklin’s magnificent boast “Where Liberty is, there is my country” Paine no less magnificently answered “Where is not Liberty, there is mine.” And as he spoke he fought, in America for the right of self-government, in England for the right of free speech and a free press, in France for the living rights of man himself as against the dead hand of feudal tradition. In all this Paine was that rare thing, a tribune of the people without self-interest. Possibly the most influential author of his day, he had but a modest pride of authorship. He could have made his fortune a dozen times, but he lived and died in poverty—died the same Ragged Philosopher he had lived.